In July we decided it was time for a puppy and after lots of research we picked the Shiba Inu to be our new puppy. It is a Japanese dog with a similar appearance to an Akita but much smaller. Well since they aren't the most common dog to find we had to go through a breeder to get them. We have been patiently waiting for the pups to be born and then be old enough to leave their mama. Yesterday they turned eight weeks and were able to leave mama so we took a little mini trip out to Ft. Morgan to pick them up and bring them home. We were only planning on bringing one home, but when we saw them we just couldn't bear to separate sisters. They are such good puppies and lots of fun to play with, sometimes I forget they are in the house since they are so quiet. Joseph is loving playing with the girls in the backyard, there favorite game right now is tag. Of course the girls have an unfair advantage they tag team Joseph from each side. Joseph showing Hana and Boo how to chase. Checking out the new place. This week has been full of Halloween activities. It started with a Halloween playgroup at Stephanie's house with tons of fun things to do with all his friends. Then on Friday Joseph had a party at school with a magician. I was a little disappointed with the school party, because other then the magician they had nothing else for the kids to do. Then tonight was our ward's Trunk R Treat and that was entertaining to see all the kids and their costumes, but it was a little windy so once Joseph's candy bucket was overflowing we came home. The kids making sure that the block did fly, and it did I saw it. The other day we carved pumpkins and Joseph was very eager to help as long as he didn't have to help with the gutting of the pumpkins. So once the pumpkins were gutted we picked out our scary designs and went to work. 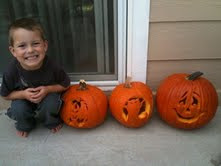 Joseph had so much fun poking holes in the pumpkin and helping daddy carve. 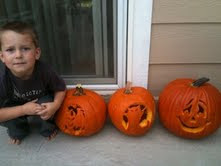 Joseph making a scary face like his pumpkins. For the past few months Joseph has been asking when are we going to go bowling, so for his birthday we took him to Fun City and went bowling and then went downstairs to play Skeeball. 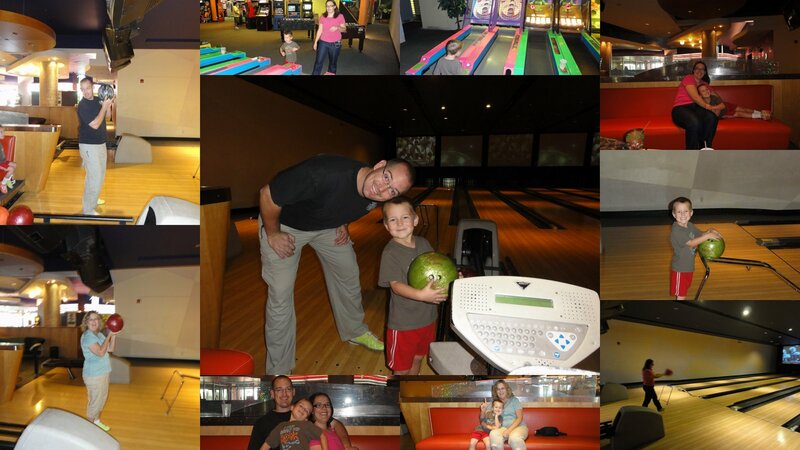 We all had so much fun and Joseph is quite the bowler, he has natural talent just like his mom. :) The whole time we were bowling all Joseph wanted to get was a strike and he did it all by himself, he was so proud! !